Sipin Lake, also known as Solok Sipin by local residents, is located in Simpang baluran Kenali, District Telanaipura. The word 'solok' in the local language means lake. Apart from being one of the tourist attractions in Jambi, this lake is the place where there is cultivation of freshwater fish such as tilapia. In the middle of the lake, you can see a lot of the fishermen’ cages and nets. If you want to see the activities of fishermen from up close, you can hire a boat to get around the lake. The boat can accommodate 3-4 people with rental costs Rp. 5,000 rupiah per person. Being around and feeling hungry? You can drop in to a row of food stalls around the lake. Cooked fish is guaranteed fresh for a new catch by local fishermen. The lake is very crowded in the afternoon, there are many people who visit this place to enjoy the afternoon breeze, and the view of the sunset. This place is becomes most crowded by the visitors during 16:00 pm. 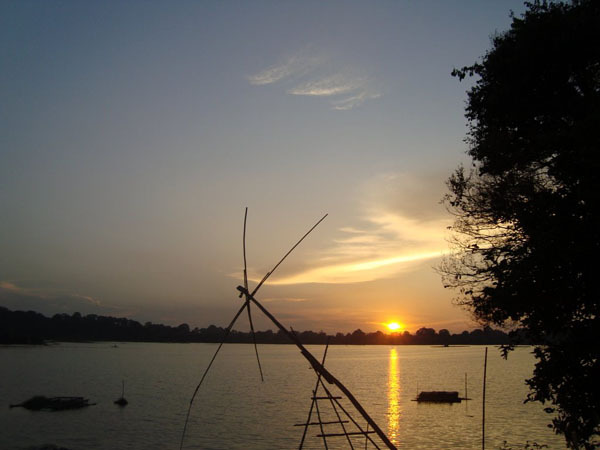 Sipin lake is located on the outskirts of the city of Jambi. The location of the lake is located in Simpang Buluran Kenali, District Telanaipura, Jambi, it precisely located in Unja Faculty of Medicine (University of Jambi). To go to the location, you can take public transportation, private vehicles or rental car. The access is easy to find and affordable to reached. However, if you use public transportation, you can use public transportation with route or direction of Broni-Telanaipura-Seberang. You can also take public transportation of Angkot Biru or the car with blue color with route to Seberang. This angkot (public transportation) departs from terminal Rawasari, and make sure to the driver that the transportation passing through Buluran. Then, once you get in front of Sultan Taha teaching hospital, you can get ready to go down because of the distance to Sipin Lake is near. Approximately 200 meters from the gates of the Faculty of Medicine, University of Jambi you have been able to enjoy the beauty of the lake.